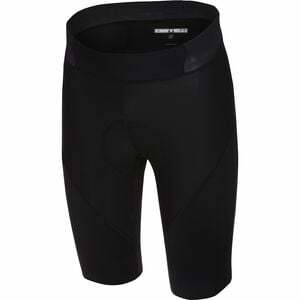 Product Condition: The Velocissimo IV Short - Men's is in Excellent condition. These shorts were previously owned for three weeks. The following observations were made regarding these item. *They were used for an occasion. *There aren't any defects in them at all. *They got minor dust/lint/dirty, cleanable. *All items sold as is, all warranties void. As its name suggests, the Castelli Men's Velocissimo IV Short helps you move as swiftly as possible down the road, all without uncomfortable pressure points or chafing holding you back. It provides a superb fit with its Pro Dry Soft fabric patterned to move stitching away from sensitive areas that lead to annoying irritation. Smooth flatlock stitching lies flat against your skin, so it won't lead to irritation or chafing as you pedal at a swift cadence on training rides and grind it out across long distances. Castelli eliminated the elastic leg bands that tend to dig into your skin, replacing them with raw-cut leg endings with vertical silicone grippers to ensure the bottoms don't ride up and require mid-ride adjustments. The Doppio waistband provides additional stretch around your stomach, also ensuring a secure, non-slip fit with its wider design that better distributes pressure. It's finished with Castelli's KISS Air chamois, which tapers in thickness from 4 to 14 millimeters from the sides to rear, giving you optimized padding and support where you need it and greater flexibility to pedal and maneuver your bike. This chamois is comprised of dual-density, dimpled foam that rapidly draws perspiration off your body where it can readily evaporate and prevents odor build-up with its anti-odor treatment.